Some of the best things in life come in pairs: a pair of comfortable socks or a dazzling pair of earrings, two wings on a bird, two speakers in that deluxe sound set, or even two skates to roll down on the road with. Our luxury two-bedroom apartments at Alexan 20th Street Station not only give you the two bedrooms that you need, but also amenities to spare that you didn’t even realize you wanted, and with a wide range of unique floor plans it’s easy to find the right one for you. 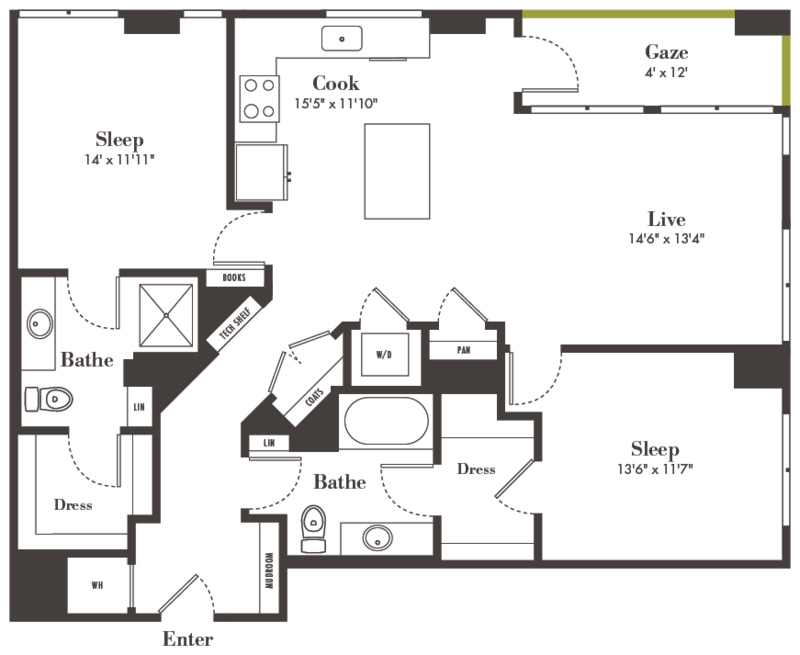 One of our luxury two-bedroom floor plans, the B7, grants both a large living space – 1,237 square feet to be precise – and no limit on creativity and comfort for any resident. The two bedrooms rest on opposite ends of the apartment, giving you and your guests the privacy you need during the early or late hours of the day. They also have more than enough room to fit a plush king-sized mattress, a refreshing spa inspired bathroom with a large soaking tub or a stand-in shower, and an expansive walk-in closet for easy outfit organization. Share your favorite recipes and snacks in the open kitchen, complete with ample pantry space and a chef’s island for added convenience. Finally, lounge back and enjoy your spare time solo or with loved ones in the gigantic living room, connected right to the private balcony overlooking our lovely community and Denver views. Double up your realm of comfort here at Alexan 20th Street Station. Take a look at all our luxury two-bedroom apartments, including the B7, and sign up for our pre-leasing offers as we prepare to open our apartment homes this spring.